Sodha Akbar says "Salaal Mugamaddhu baai, veg biriyaani ready"
I had an eventful week. I saw Jodha Akbar and then went on a short 2-day business trip to Charlotte, NC. The business trip seemed shorter. So the moment I got back to IST, while my biological clock is still sightseeing somewhere in the middle of the Atlantic, I decided to, in the interest of public service, to shoot an email to Ashutosh Gowariker asking him to shorten the movie to something less than the time it takes a medium sized star to turn into a white dwarf. But since this is a blog with a fairly tenuous connection to the restricting limitations of real life, let us imagine that I actually did send this email to Mr. Gowariker. We are ok with the movie till the point where Jodha marries Akbar. After that we find, to quote Lord Vader, the lack of Tansen disturbing. Remember the scene where Akbar is in the Diwan-e-Aam (Sofa made from Mango tree) and this important event is interrupted by strains of Jodha singing “Man Mohanaa”? The emperor then declares the session closed and joins his lady love in singing some Krishna bhajans. At this point, we believe Tansen should intervene and point out that Jodha is way off the original Raga in which the composition was set. He then goes on to demonstrate how it should be sung and Jodha is shamed and decides to go back to her Paattu maami to start over from Sarle Varise. Akbar then goes on to marry 700 more women and lives like every other Mughal emperor. Some harm and a lot of harem. Length of Movie – 30 minutes. Akbar wins lots of wars. He then decides to marry Jodha. His army throws a bachelor party and invites Sufi singers to sing “Khwaja Jee”. As anybody can clearly see, this is a plot by the Gardening Club of Panipat to assassinate the emperor for his reckless laying waste of gardens and nurseries in Panipat in 1556. This is exactly why the singers are symbolically wearing flower pots on their heads. 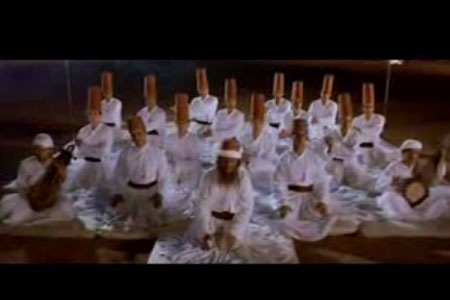 Once the song finishes, Akbar joins in the Sufi trance and at that moment, one of the potheads releases a King cobra which goes on to kill the emperor with a deadly bite. Of course, it’s not historically accurate, but hey, neither is your original movie. We are OK with the movie till the point where Aishwarya Rai serves the emperor a lavish self-cooked Rajasthaani meal. Now, imagine a former Miss World cooking a palace meal. Now, we are not doubting that she could rustle up some Maggi noodles or perhaps microwave some MTR precooked meals, but hey, a full meal for the palace? Here is the shortening (not the culinary type, he he) that we recommend. In the process of cooking Rajasthaani Kadhi, all the L’Oreal and Revlon cosmetics she is wearing mixes with the food. In addition, her diamond studded Longines watch falls into the mix. So when she serves Akbar and Maha Maanga demands that it is customary for the chef to taste the meal in front of the emperor, she does, and ends up fainting as a result of a lack of a digestive enzyme for L’Oreal face wash. Maha Maanga says – “See I told you so”, and Jodha is banished from the kingdom and Akbar lives happily ever after eating Lamb Biriyani. This movie is not only unnecessarily lengthy, it is also a blatant distortion of history. Our problem with the movie is scene nr 1 – Akbar’s battle with Hemu. When Bairam Khan attempts to behead Hemu, his sword breaks into two and Hemu is unscathed. Bairam Khan is enraged and attempts to behead him again with another sword. That one also shatters. Hemu then reveals himself to be an avatar of Vishnu and everyone in the battlefield is humbled and the Mughals go back to their native Uzbekistan. When Jodha lays down conditions for her betrothal with Akbar (No conversion to Islam, Krishna shrine etc), the emperor’s thoo-neelaam-oru-ambaley type docile response is despicable. In our world, Superstars, Ultimate stars and Supreme Stars usually say – “Ei. Saridaan Podi” (Hey. I request you to take your leave) and go on to do heroic acts and make the heroine fall at his feet at the end of the movie and beg for his mercy and agree to be ahangaaram-less and get married unconditionally. Basically, most important scenes involving Jodha can be cut and only the hero can be focussed on. Length of movie – 2 hours. We are OK with the movie till Akbar’s attempt to tame the wild elephant. It is a complete insult to the elephant’s leg-eye-trunk coordination skills when you show it missing Akbar many times. Elephants are physically more agile than humans are. Here is what we propose. The elephant raises its foot to crush the emperor. It doesn’t miss. Do read Maami’s post on the real Akbar and Greatbong’s take on his nama. Hahaa…. Now I know which version of the movie to watch !! Yours! If Jodha replied “Ser dhaan Poda” then the movie would have titled as Poda Akbar…. Tamil la padam dub panna – Rajadhi raja, Raja maarthaanda…… etc liye padam padhi odi irukkum 😛 Good post thala. Charlotte and u dint mention us.. Unga US fanclub la irundhu oru virundhu arrange panni iruppome…. totally appreciative of the humor u bring out! @Hari.. lols at Poda Akbar! I am somewhat disappointed that you did not mention the scene(atleast 8 minutes long) where Akbar is practising his sword fighting and flexing his muscles. Raja raja, raja marthanda, raja bhupathi, raja chakravarty, many thanks. This subject’s piece is not as worthy as your Mightiest of Mighty hilarious piece. But I’m blown away at Rushdie’s fancy recreation of Jodha as a figment of Akbar’s imagination, as a seductive creature of his mind. Ashok: I pilfered a copy of the New Yorker from the Lufthansa flight to New York but I managed to somehow miss this one. I read it now. Very interesting. i started reading ur blog since it was mentioned in rasikas.org for some carnatic review but this review of jodhaa beats it all… extremely funny and now i’m glad i made it to the the movie on a snowy day since i was able to enjoy every single line. of the blog.. u hv a great sense of humor! keep ’em coming! Wow! now I MUST see the movie (or maybe not)! I’m a recent addict to your blog! You have an unbelievable imagination! WOW!! Pettai in the house! Reprazent! Sigh!More publicity for an absolutely missworthy film. Why do lousy films have all the luck? Gowariker absolutely deserves your looong attachment. The sponsored links on the side of your mail – priceless! I am peeved for another reason – subscribed to your blog by email but got here coz a friend alerted me that “the great KA hath posted again” The email delivery takes a looong time eh? Or maybe, as one of your commentors put it, some of us just need the KA fix. Regularly!! Help! Are there blog de-addiction centres in Chennai? While everyone one my blagrollu has taken a jab at the movie, ungalodu review late a vandalam latest a irruku! After watching Bairam Khan beheading Hemu , young Jalal begins to idolize him. However fearing the public ire he exiles Khan and gets married to a rajput princess. On the wedding night he sees a divine light and Khanbaba’s face appears on the horizon. He realizes that they were meant to be and the grave sin that he committed. The next morning on the pretext of leaving for awadh he escapes to join his love! The movie was named ‘Brokeback Akbar’ but didn’t pass the censors also fearing the wrath of the Bacchhan family AGPPL had to give jodha 153 mins of screen time. The rest is what you all have seen! I had to leave the movie theater at 9:30 because there were no signs of the movie ending and any later and I would have been locked out! Whatay waste of money I say! Stunning stuff. I think while we’re at it, we can ask paattu maami to teach Aishwarya some mandhra sthayi to help her sound less squeaky when she laughs. Yet another brilliant blog.I am sure you will be one of the “Pioneers” in the “Art of Blogging” book that will be written some time in future. I have not seen the movie but I got the feel of how a person with great imagination will feel after seeing the movie. I am regularly reading your blogs everyday now.It’s very addictive.Please do something about it. You put Salman Rushdie to shame. I enjoyed your writing better! Fantastic post…..Once again room pottu think pannuvengela….ippidi ellam supera write pannarathuku. Keep the good work going. I’m so tired of saying I laughed out loud while reading your posts now. I meant “say” not “saw” ! I think what you ACTUALLY meant by the title was “Soththa Akkupar says, “Salaal Mukammathu pai, vechchu piriyaani ready” “, right? Jodha was good according to me.. But your Poda is just awesome. I haven’t had the chance to see the movie yet, but I have heard it’s long!!! I wish Rajini was some where there in the picture. 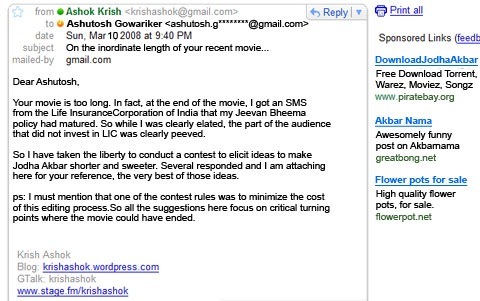 He would have single handedly increased the pace of the movie…..
May be you shld send the email to Gowriker! That shld prevent further instances of such movies happening. you think? If that works, then I shall stage a dharna in front of the numbskull that made Dhoom 2!!! Your nuts! That was entertaining reading! How the hell do you lend variety to entertainment! stupendous stuff! cumin to think of it, akbar lost a chance 2 bee wyd 700 odd women, jus because of his failure to depriciate jodha’s raga- sob story- he must ‘ve been one hell of a dumb emperor..
the movee spun out TANISQ as its main brand endorsement.. imagine the moovee with only the tanisq jewellery-clad men n women scenes.. this would have been a sooper dooper gems, gold n antique STONE scene set, with the audience throwing KALLU(STONE) at the screen..
Great Reading !! This has to be the best review of this movie that I have read as yet !! i dont understand how come most comments also support your stupid review which doesnt make any sense. wud u have liked the movie had it been one hour short? there has been enormous amount of research, mesmerizing music, quite a few scenes which catches the attention(like elephant taming, ash-hrithik sword fight, beautifully decorated palaces). may be u might have watched without the subtitles or you was not able to understand the hindi/urdu. thats why it was quite boring for u.
anyway a great movie to watch and highly recommended for everybody. I know. About the RSS. Like I said, some of us just can’t wait! @ABOVE: Claims made by a person who lacks the needed degree of expertise to make a reliable claim will, obviously, not be well supported. When the review is ad hominem and not on the subject the comments made on the review will also have the same quality. I saw the movie, and I understand Hindi/Bengali/Marathi/Urdu/Tamil very well… and I won’t say the movie is a recommended one… its a Masala flick with a glossy picture of an epic! well. everybody has got a different opinion. turn to the real critics – NY times , NDTV. As long as it is entertaining does that matter whether its a masala flick or great epic!! The comments are in the same league as KA’s writing? Honored!! Yenna complimentu!! when i say that everybody has got different opinion i indeed accept that others have got their own opinions. my contention is only that this review is meant only to evoke laughter among the “well wishers” of this blog and not to do a decent review of the movie. 1.Jodhaa Akbar is just two things: an extended jewellery commerical and a Hrithik-Ash showcase. People with a taste for these will like the film. Not a problem. To each his/her own. But to claim that it is anything else is an insult to Indian cinema. In fact, Gowariker has clearly pitched the film along these two lines.The historical accuracy controversy just came in as very handy manna. What better way to “review” (I dont think that was what KA was doing) a film like this than with humorous alternatives?! !! As for expertise – the NY Times certainly has expertise in several things. Bollywood is not one of them. We can write our own reviews, thank you. KA may not be an expert, but he invariably has an original point of view and expresses it in lucid, entertaining prose. Qualities worth appreciating. But then, it takes brilliance to appreciate brilliance. What say KA? 🙂 And my apologies.Never again!! Ultra Super dol dapi top tucker hilarious!! This is the first time I am reading your blog. Now I am addicted. “It takes brilliance to appreciate brilliance”. That ends the matter and its perfectly fine with me and for those who appreciate jodha akbar. Whether the movie is a fiction created in the mind of gowariker or the real happenings in the 16th century is something different. If somebody chose to ignore its soul filling music, magnificient performance, genuine and risky stunts, dialogues of a bygone era and concentrate only on the length of the movie and on the jewellery of Aish, I am not sure if they can enjoy any other movie also for that matter. Indian cinema had its fair share of contribution to the world cinema with some great movies. (Sivaji, OSO to name a couple). It takes guts and imagination and talent to create something different and unique and by doing this other works of our great Indian cinema had been terribly insulted. And if some experts and news channels give free publicity to movie is it the director’s mistake? The anger on the news channels and the experts seems to be directed towards the movie by some people. It’s his space and I have no right to criticize his review and that too in his own blog. But having seen some thing in the name of review and comments which is nothing but noisy chorus I can’t help myself from writing. But thank you. The scales have crashed from me orbs. The next time I see the film, (which will surely happen since most TV Channels will soon start relaying it with relentless regularity) I shall keep my eyes and ears peeled for the soul-stirring stuff. WOW, it is really interesting to read the comments rather than the blog!!!! Thank you. And whoa, I don’t check for comments for 2 days and there’s a debate going on and I’m not part of it? Second off, I usually ask all angry commenters this – would you like filter coffee or tea? Third off, this is not a review. Lavanya stated it right. If you do a search for the word “review” or its synonyms, such as “synopsis” or “rundown”, you will find no results (except in the comments section). For one, reviews tend to be written at the time the movie is released, and this post is clearly a couple of weeks late at least. Plus there are, as you said, several qualified commentators who “review” movies. Reviews also contain subjective judgements of the various aspects of the movie, like the music, cinematography, story etc. This one makes no such mention of any of these things, for the simple reason that it is not a review. The only aspect of the movie that this post primarily focuses on is its length, which, at 3 hours and 45 minutes is, shall we say, hamaapkehaikounesque. So, purely for speculative, fictional purposes, this post explores possible ways to shorten the movie by looking at the various objections that different groups in India might have. I was wondering if we had a Tamil remake of Sodha Akkubar, and T Rajendar was Akkubar – how would the elephant taming scene be (forget sword fight)… the khwaja song instead, would have been a dappanguthu number…. Lavanya: I don’t think you are going to be satisfied or happy with whatever movies u watch. Krish: ur right indeed. Its not a review and the post talks only about the length of the movie. I got it entirely wrong. I got routed through this blog thru Chennai metblogs and find some of the posts here very interesting. Jodha was good .. it wud hv been better if it had been shorter . ;) .. and also Gowariker does not know the art of making movies- short and sweet, look at swades- it was good but was a hell too long.. I loved the hilarious write up about Jodha Akbar…But from a woman’s perspective A glimpse of Hrithik’s chiselled features, flawless expressions,striking smile,sculpted body,and most importantly his charisma as Akbar was worth a watch. But its just so unfortunate that the sizzling chemistry was not reciprocated by the wooden and plastic, frozen Jodha.Ya….the part where he magaed to force an elephant into submission was a little too much…but i guess the elephant was a female and looking into Hrithik’s eyes must have wanted to swoon into submission anyways.Well Jodha Akbar gets a must watch rating from me for all those Hrithik lovers. Worst Blog ever. Please do not blog if u dont appreciate good work. Ashok: It might be worthwhile if you state your case about why Jodha Akbar was “good work” and participate in the conversation instead of demanding that I stop blogging 🙂 And oh, this is not a review of the movie. It is just a shady exercise in imagination of how it could have been made shorter. Been looking around for a blog that smacks of namma Chennai 🙂 and I’ve finally found it (yeah, am a latecomer!) Great blog! “a medium sized star to turn into a white dwarf.” i actually first imagined an actor of medium height, growing shorter and whiter with age . YemTeeVee made some crap sh!t on JA some time ago all in the name of fulltoo faltooness but this one was miles….Gowariker-Miles ahead of that! Je me renseigne sur le référencement. Que pensez vous de ces renseignements:. Une excellente technique en référencement passe par demander une formation de référencement SEO avant de confier la prestation de référencement google à un référenceur seo. Vous en sortirez armés à superviser et appréhender de nouvelles méthodes de référencement. Eclairez moi, s’il vous plait.